Halloween was so much fun! To be honest, I love the preparations for Halloween, buying candy, deciding what the kids are going to wear, the fact that Halloween sort of heralds in the holiday season. But I am not crazy about Halloween itself. It hasn’t helped that the last 2 years Chris has been gone. But this year the weather was perfect. 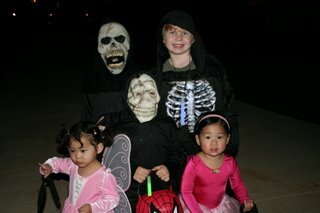 Things were going awry until we actually left for trick or treating. Dinner was in a rush, the kids didn’t want to eat. No one could find all the pieces to their costumes. The boys were fighting over which skeleton mask was theirs. But as soon as we left the house things took a big turn for the better. 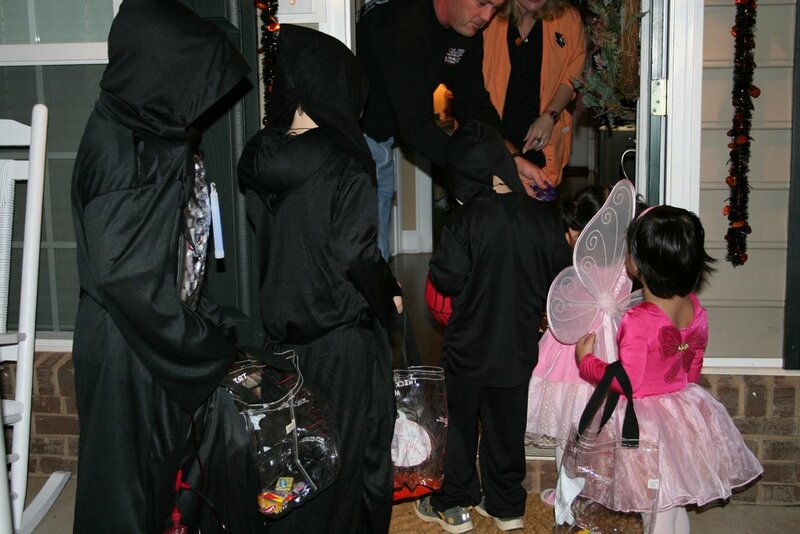 We live in a great neighborhood for trick or treating, houses close together and no hills or long driveways. So it was a short trip to our first stop. Isabelle realized quickly that all she had to do was hold her bag out and that candy would be deposited, no questions asked. 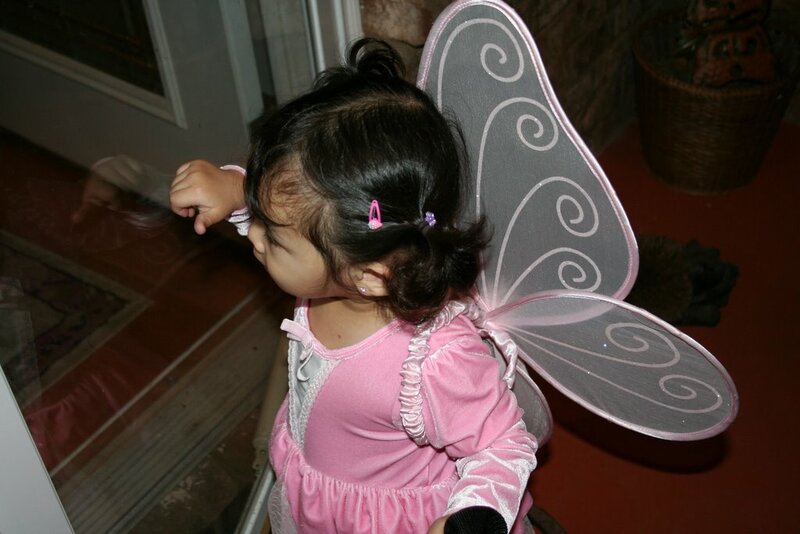 Soon she was leading the pack, holding daddy’s hand and saying, “Run!” with her little wings flopping on her back as she went. At every house she pushed her way to the front and, even though the boys had rung the doorbell, she insisted on knocking on the door. 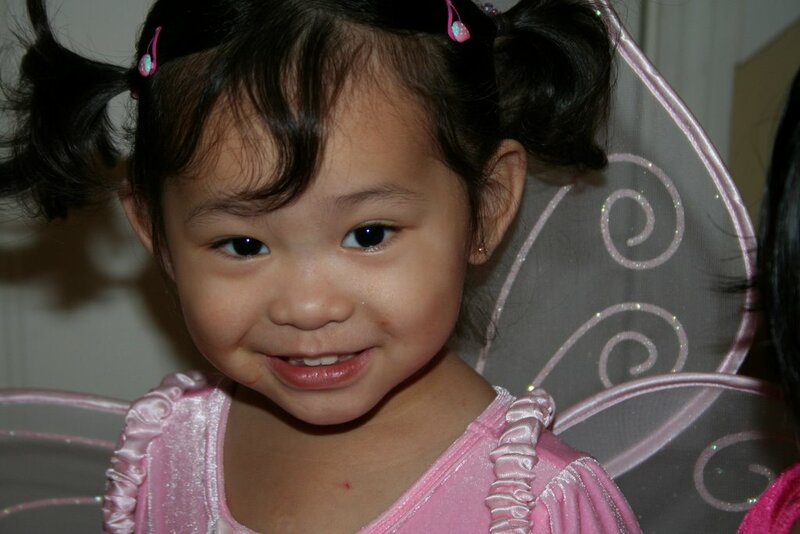 She even started to say, “Trick or treat!” in her endearing Isabelle way. Honestly, when I was a kid, we walked 1/4 mile between houses and when we finally got home, at least 3 hours after we started, we hovered over our newly acquired candy as if it were the last sustenance on earth. Kids these days have it too easy. Only the girls had the true spirit of the evening and were happy to continue on to the very end. After we got home everyone poured over their booty and sugared up good for the evening. I don’t care much for the scary part of Halloween, but you gotta love the candy. Here is the strange thing, and I went back to the website to see if I could find her birthday, is it Jan 20, 2005? That is LiLi’s birthday! It but a smile on my face and I just wanted to share that with you. Take care and the girls are growing up so beautiful! I love Belle’s curly hair and Sophies sweet smile! God we did hover over that candy like it was the last sustenance on earth, didn’t we?? Loved your recap on the evening, and I’m so glad you guys had lots of fun…the costumes were all awesome, and the 2 girls were adorable- as usual! I love reading your blog about your beautiful family on Halloween. I remember Halloween so well. It was such a big occasion with so much excitement in preparation. 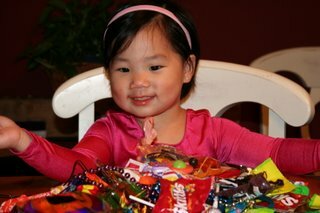 I remember distinctly how much fun it was for you and your siblings to compare candy piles. 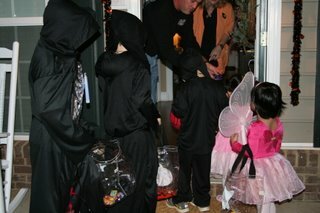 Then the swapping of candy began. It was a VERY big occasion. 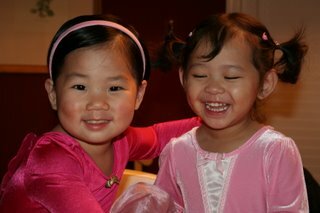 The children’s costumes were great, and Isabelle and Sophie look adorable. This brought back great memories.